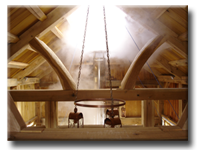 The Grossman Family Sugarhouse is a traditional timber-framed building. Over 550 pinned and/or wedged wooden joints hold approximately 7900 board feet of hardwood timber together forming a rather robust structural framework. 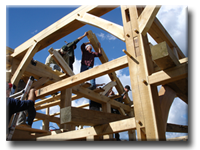 The framework pattern, or design, has its roots in historical medieval English framing. Some of the joinery, however, can be traced to the Germanic settlements of early Pennsylvania, and even further back to both Holland & France. 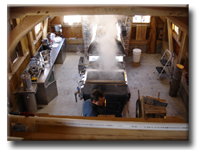 The majority of the wood, both timber and lumber, was harvested from the farm’s sugarbush/woodlot in the spring of 2005. Timber was milled both on-site and at a nearby farm. 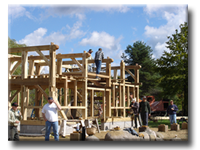 The joining, or cutting, of the framework also took place at a nearby farm and spanned the better part of 4 months before the completed pieces of the framework were transported back to the Grossman Family Tree Farm. 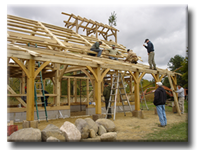 The timberwork was assembled & erected by hand with help of family and friends during a beautiful autumn weekend in October, 2005. 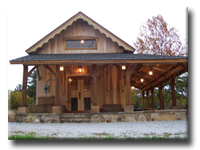 The species of wood used in the framework is typical of the early vernacular timber-framed buildings in our area of the Ohio Western Reserve. Yellow-poplar, Cherry, Sassafras, & White Oak are the major timber species with Red Oak pins holding it all together.